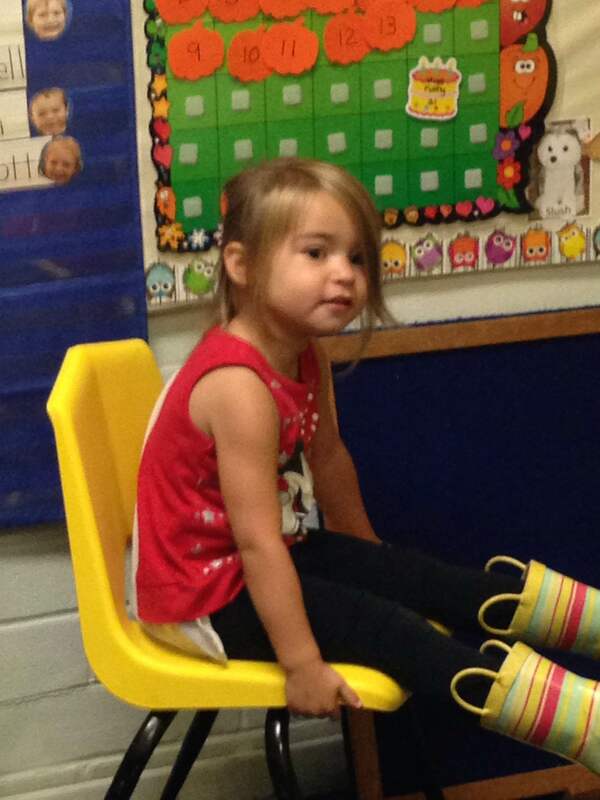 As the day began Alexandra went into Room 4 and sat in the teacher chair to announce Circletime. All of the children came in. I asked her if she wanted me to read a story. I was the guest reader and she stayed in the teacher chair. I read, “By the Light of the Halloween Moon,” by Caroline Stutson. By the silvery light of the Halloween Moon! and a sprite reach for someone’s tapping toes. This is a perfect example of emergent curriculum inspired by the children. Meaning we did not wait until planned Circletime to hear this story we enjoyed it when they thought it was a good idea. 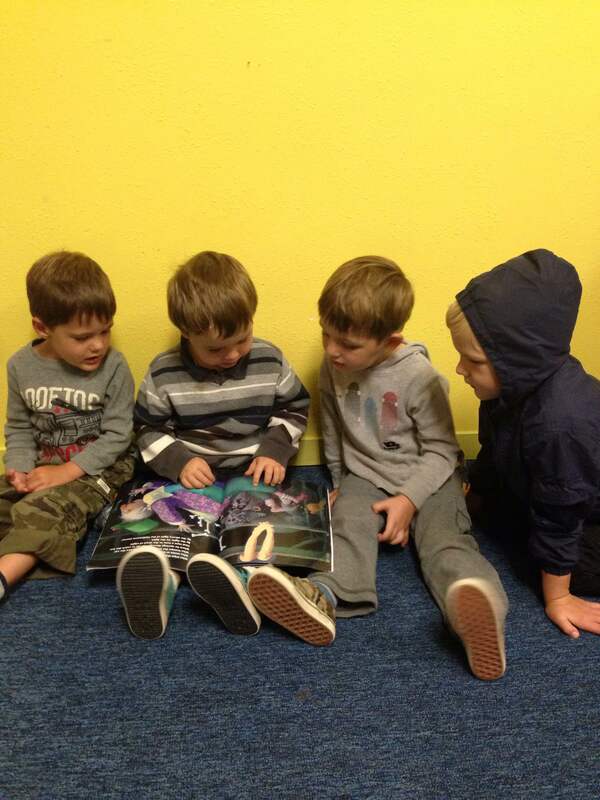 They were so interested in this book their eyes were glued. This book builds with a new character on each page repeating the actions of the previous page. It is read in a rhythmic way. Eventually the children can join in because they learn by repetition. We encourage them to join in and be a part of the fun. This is much like, “Rattlebone Rock,” which is a favorite. This is an interactive story that is read by doing a rap. Again, the rhythm really captures their interest. Among other stories Caryn read,”Big Pumpkin,” by Erica Silverman. This story also builds with each page repeating actions of the previous page and adding the new action of each additional page. This story can be chanted or acted out by the children as an extension activity. 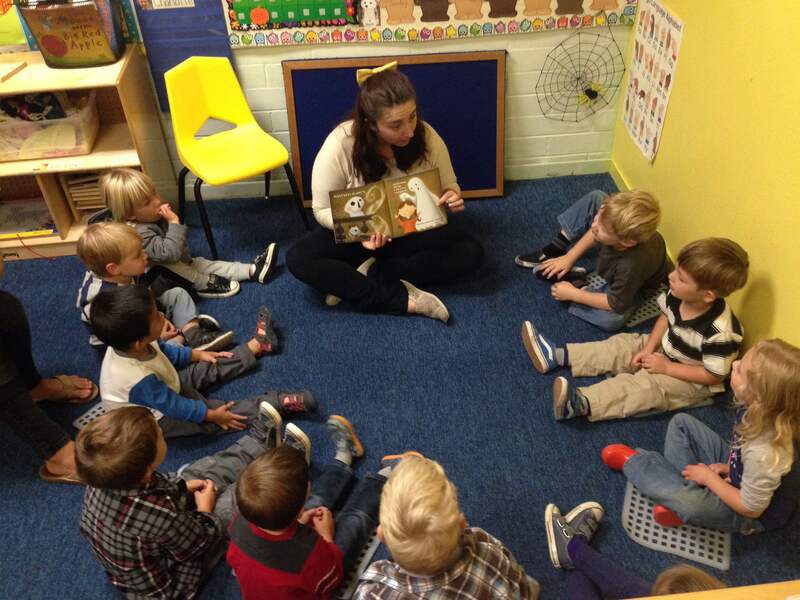 Reading to children is wonderful but especially fun in October as they anticipate what might come up next. They really do not remember Halloween that well, or rain so their “sense of wonder” in the discovery is so fun to observe in their eyes and smiles. All books mentioned can be purchased on Amazon. Also pictured here is Gavin feeding a carrot to Shanti the rabbit. All children had the opportunity to use stamps on orange pumpkin paper. That is process art where they decide how it is going to look. We look forward to seeing several of you at the Aebleskiver Breakfast this Sunday 9:00-11:30. Have a wonderful weekend. By sscdc1234 in Uncategorized on October 14, 2016 .